Manager Mick Wadsworth has left the club following last night’s 2-1 home defeat by Forest Green Rovers, their fifth home defeat of the season. The Blues have won only two of their opening 13 games. Wadsworth has only been at the club three months and joins a long line of managerial casualties over recent years. Assistane manager Simon Davies has also left the club. Last night the Blues turned out a terrible first 45 minutes against a team also struggling at the wrong end of the table and could have left the field at half-time trailing by more that the two goals they already were. In front of a crowd of just over 1,000, Kevin Roberts did pull a goal back soon after the break but the Blues were unable to add to that effort and remain on -14 points having picked up just 11 in their 13 games to date. Experienced player Tim Ryan and coach Billy Gerrard with look after the side for the weekend’s visit to Hayes and Yeading United. City will be looking for maximum points when they entertain Forest Green Rovers at Deva Stadium tonight (19:45hrs). Manager Mick Wadsworth will be without young on-loan defender Chris Lynch through injury. Midfielder Clark Keltie is set to make a home debut after joining on a month’s deal from Rochdale. Blues manager Mick Wadsworth was delighted with the battling performance from his side in yesterday’s cross-border derby with Wrexham. The game finished 0-0 with City striker Gregg Blundell missing a glorious chance from close range to take all three points. City on-loan defender Chris Lynch picked up a bad injury during the match. The young Burnley player has been a hit at Deva Stadium since he arrived early in the season. It has since transpired that he has a cruciate ligament injury which will keep him out for the rest of the season. North Wales police made five arrests at the match and more are anticipated in the next few days. The Blues are straight back in the action again tomorrow night when Forest Green Rovers visit Deva Stadium (19:45hrs) for a Conference match. Rovers have yet to win on their travels this season and sit in a relegation spot four places above City. The Youth Team were beaten 1-0 at home by Wigan Athletic on Saturday morning in the Football Alliance North West Conference.. It is being reported that Chester are due to sign Rochdale’s Clark Keltie on loan in time for Sunday’s local derby at Wrexham. Born in Newcastle, the 26-year-old has previously played at Darlington from 2001-08 where he made 145+35 appearances and scoring 11 goals. He has scored one goal in 30+6 appearances for Dale. The Deva Stadium office will open between 10:00 and 12:00her tomorrow (Saturday), for the sale of tickets for Sunday’s game at the racecourse against Wrexham. No tickets will be sold on the day of the game. A Former Players Association has been set up following a series of meetings between two of the club’s most popular players Grenville Millington and Gary Talbot (pictured) along with broadcaster Charlie Lambert and the club Historian Chas Sumner. The Association’s main objective is to provide a forum for former players of the club to meet and keep in touch with each other whilst, at the same time, enabling the club and the supporters to recognise its former heroes. 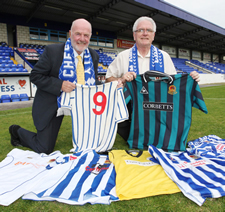 Initially membership of the club is free to all former Chester City first team players and managers. More information and contact details can be found on the Association’s website. A Sean Breen goal was enough to give the Youth Team a 1-0 victory at Marine in their FA Youth Cup first qualifying round match last night. The Blues will be now away at Lancaster City in the second qualifying round on Monday 5 October, kick-off 19:00hrs. The Blues failed to capitalise on a 79th minute Ben Wilkinson goal at Salisbury City last night as they were pegged back by their part-time opponents two minutes later as Sean Clohessy leveled following a goalmouth scramble. Before taking the lead City had Chris Lynch to thank for a goal line headed clearance that kept Chris Flood’s goal bound header out. City ‘keeper John Danby had to be stretchered off after being injured in the build up to the goal giving replacement goalkeeper Andrew Murphy a debut from the bench for the last ten minutes. The home side thought they’d picked up all three points in injury time but saw a Darrell Clarke goal disallowed for offside. Wadsworth has stated that he needs three of four more players if City are to have any chance of escaping what looks an almost certain second successive relegation. He is turning to premiership side Wigan Athletic for help, where the management/coaching team of Roberto Martinez and Graham Barrow need no introduction to Blues fans. The Blues are next in action tomorrow night when they play The Whites! Cheater travel to a Salisbury City side who lie two places above City after they were deducted ten points last week for enetering administration. They have two wins and two draws fro mtheir five home matches players at the Raymond McEnhill Stadium this season. The Youth Team were beaten 1-0 at Bury on Saturday morning. Their next game is Wednesday night when they travel to Marine for their FA Youth Cup first qualifying round match. The deadline for the latest competition is the end of the month. You can download the competition form from here. City entertain high-flying Stevenage Borough at Deva Stadium tomorrow looking for three more points following the midweek success over Gateshead. Borough currently lie third in the Conference with just one defeat in their five league games away from Broadhall Way this season and have won their last four matches including a fine 3-2 win at Mansfield last weekend. With his squad stretched to the bare minimum, City manager Mick Wadsworth is expected to name an unchanged team from midweek. His opposite number Graham Westley has a couple of doubts as he prepares for the match with forwards Mitchell Cole and Lee Boylan both struggling to be fit following injury. Those who can’t get to the game can hear BBC Three Counties Radio online commentary here. Goals from Gregg Blundell and Nick Chadwick were enough to give City three points though the home side made hard work of beating their part-time opponents from Gateshead who were reduced to ten men in the first period. In front of their lowest home crowd for nearly eight years, 994, the Blues took the lead from the penalty spot after Blundell was hauled back by James Curtis after he’d chased through on goal from a Shaun Kelly pass out of defense and rounded ‘keeper Jim Provett. Curtis was given a straight red card for the foul. Blundell sent Provett the wrong way to coolly convert the spot-kick. The Tynesiders, who created good opportunities through the match, drew level on 51 minutes as Michael MacKay scored totally unmarked from close range following Christoph Ascherl’s floated through ball. Fourteen minutes from time City sealed their second win of the season when Nick Chadwick sent a looping header over Provett following a pin-point right wing cross from Neil Ashton. City had some great goalkeeping from John Danby to thank as he saved from both Graeme Armstrong and MacKay in the closing minutes to preserve the three points. A hotly disputed penalty in first half injury time gave City a lifeline at Eastbourne Borough on Saturday. 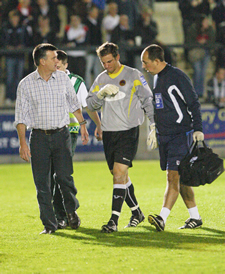 City were losing at the time from another poor conceded goal after five minutes after hesitation in defence, before Gregg Blundell (left) stepped up to send home goalkeeper Michael Jordon the wrong way after he was adjudged to have brought down Neil Ashton in the box. Both sides had opportunities to grab all three points with the woodwork comiing to the escue for both sides late on. Firstly Anthony Barry saw a free-kick headed onto his oen bar by home player Neil Jenkins, then ten minutes from time Andy Atkin should have scored his secong goal of hr afternoon but hit the left post from close range when a goal seemed certain. City have the opportunity to get one of those elusive wins tomorrow night when they entertain Gateshead at Deva Stadium (19:45hrs). The Tynesiders lie four places (and 26 points!) above City and have one away victory so far this season, a 4-1 win at Crawley Town. Tickets for the derby match against Wrexham at the Racecourse on Sunday, September 27 (kick off 12:00hrs) will go on sale at the Deva Stadium from today between 10:00 and 16:00. The price of the tickets are £17 for adults, £12 for concessions and £5 for under 16s and they willl be on sale after Saturday’s home match with Stevenage Borough and at Deva Stadium ticket office next week between 10:00-16:00hrs Monday to Thursday and 10:00-12:00hrs on the Friday. 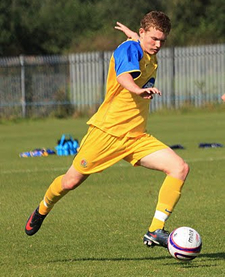 A 4-1 defeat at bottom side Port Vale has seen the youth team slip to 16th in the Youth Alliance North West Conference. 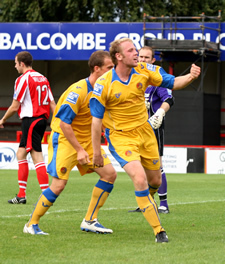 City’s consolation goal was scored by Gethin Maxwell (pictured). Chester City make their first visit to Eastbourne Borough tomorrow as they look to get back to winning ways. 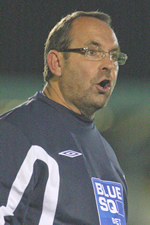 Manager Mick Wadsworth is expected to make changes to the side beaten by Tamworth in midweek. The City boss is already without striker Lewis Alessandra, while Shaun Kelly picked up a knock to his knee injury during Tuesday’s defeat and may miss out on the trip to Priory Lane. Both Glenn Rule and on-loan Adam Kay could be recalled as City look for their first away win of the season. Borough are currently 15th in the Conference and have two wins over AFC Wimbledon and Barrow, a draw with Rushden & Diamonds and a defeat by Ebbsfleet United from their home games this season. Those who can’t get to the game can hear BBC Sussex radio’s online commentary here. A goal from Gethin Maxwell gave the youth team a 1-0 win at Nantwich Town in the preliminary round of the FA Youth Cup last night. The side now travel to Marine in the first round for a match scheduled to take place on Wednesday 23 September. Two moments of poor defending cost Chester dear as they were beaten at home 2-1 by Tamworth last night. City fell behind on 37 minutes as Richard Tait latched onto a through ball. Just before the hour Chris Smith was left unmarked to double the visitors lead. Nick Chadwick did pull a goal back with 15 minutes remaining but the Blues were unable to convert some late chances for an equaliser. Six players received yellow cards and this could well mean a fine from the FA. Midfielder Stephen Vaughan has joined Cheshire neighbours Northwich Victoria on loan. He played in the first six matches of the season and was substituted during Saturday’s win over Histon. City recorded their first win of the season on Saturday beating Histon 2-0. Headed goals from Kevin Roberts and Nick Chadwick secured the points against a side who had much the better of the opening period. This was City’s first win since the 2-0 defeat over Accrington Stanley on Boxing Day last year, ending a dismal 14 match winless run. On loan striker Lewis Alessandra picked up a bad ankle ligament injury just before half-time and is expected to return to Oldham Athletic. The Blues will be looking to extend their undefeated run further on Tuesday night when Tamworth visit Deva Stadium (19:45hrs). The sides last met in December 2003 when a rampant City won in Staffordshire 5-1 with goals from Carl Ruffer, Alex Smith and a Daryl Clare hat-trick. The away fixture at Grays Athletic, postponed on the opening day of the season, has according to their official website been rescheduled for Saturday 7 November. This is also the date of the FA Cup first round proper. Striker Gregg Blundell could make his first start of the season tomorrow when City host Histon. The is the first competitive match between the two sides. Blundell has come off the bench twice this season since recovering from injury, and played 80 minutes in the midweek friendly against Macclesfield Town. Anthony Barry will once again miss the match through injury. The visitors currently lie in 18th place. They have seven points from their opening seven matches that includes an 3-0 away win at Gateshead for the Cambridgeshire side. City have back-back home fixtures as Tamworth visit Deva Stadium on Tuesday night (19:45hrs). Midfielder Fabián Yantorno (left) has had his contract cancelled by City before he even made a first team appearance. The 26-year-old Uruguayan played under boss Mick Wadsworth at Gretna and was the manager’s first signing of the summer. He’s failed to recover from a knee injury picked up pre-season though and is believed to be heading back to South America. His one fleeting appearance in a City shirt came last week when he came off the bench for 15 minutes to play in a friendly match against Crewe Alexandra. City are still searching for their first win of the season following the weekend's fixtures. 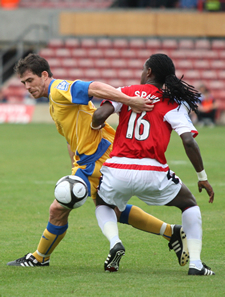 Saturday's 1-0 defeat by Mansfield Town was followed yesterday with an away point from part-timers Altrincham. Ben Wilkinson scored his second goal of the season to equalise in the second period at Moss Lane after the Blues had fallen behind to a Colin Little goal midway through the opening half. With today’s 17:00hrs transfer deadline passing with no action Wadsworth has hinted that new faces may be brought into the squad. Another behind closed doors friendly has been lined up tomorrow to look at two out of contract players “one from abroad and one from down south” added the manager.